Sorry it's been so long since my last post! It's finally Freshly Made Sketches time again, so I had to post today. 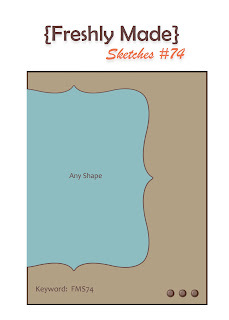 :) Tui has this terrific sketch for us this week. I'm sad because this is her last sketch with us, but I'm also happy for her because she's leaving to do some amazing things! 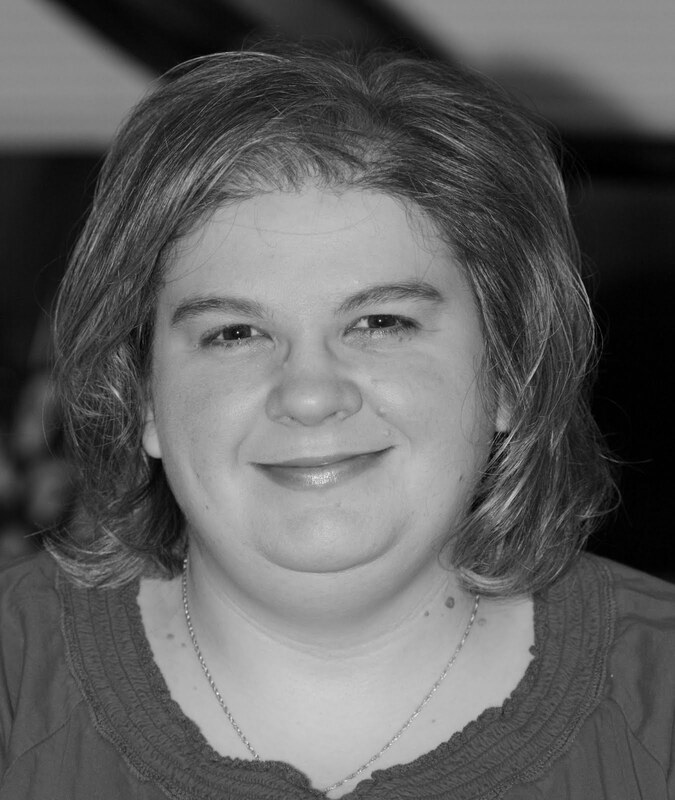 Be sure to stop by her blog and leave her some love this week! This is so NOT what I had in mind when I sat down to make my card. I don't know what happened to my original idea but it didn't come back. This reminds me of the couch my parents had back in the 80's. It had wagon wheels, but Ferris wheels, wagon wheels...it's all round, right? What's so bad is that that couch had blue flowers and what color did I add? BLUE!!!!!!! Hopeless mess. 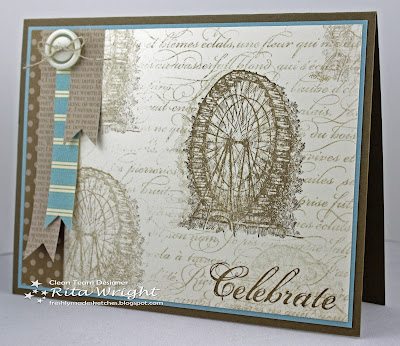 Hopefully somebody out there likes 80's wagon wheel couch cards...this one is totally for them! Now I'm off to tease my hair and listen to some hair metal bands. Ha! My sweet girl is 8 months old today. It's crazy how fast time is flying by. 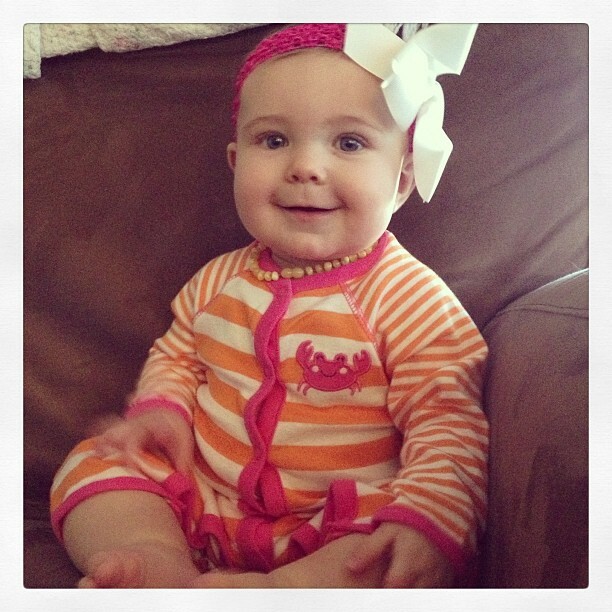 She's grown so much this past week that we are going to be moving up to 12 months clothes soon. The 9 months are just too short now! That happened overnight. Crazy, crazy. 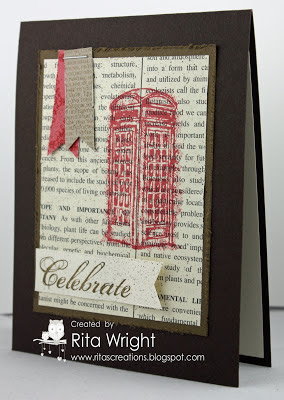 I found a little stamping time yesterday, so I thought I'd play along with the new sketch challenge on Splitcoast. I thought it was a fun one and immediately had an idea! I LOVE the Chocolate Bunny stamp. I didn't buy it when it was current, but was able to purchase it from my friend Ann when she was ready to send it to a new home. It's one of my favorite stamps and will always be in my collection for sure! I used some of the gorgeous Sycamore Street DSP that you can get for FREE, yes, I said FREE, during Sale-a-bration! A bit of embossing, a banner, and a button finish off this simple beauty! Jason and I have been kind of bad about taking Laila out to restaurants because we weren't sure if she'd be okay or if she'd get upset and we'd have to try to pack up things and scramble out of the building. We were brave on Tuesday and went to Chipotle and she did great! 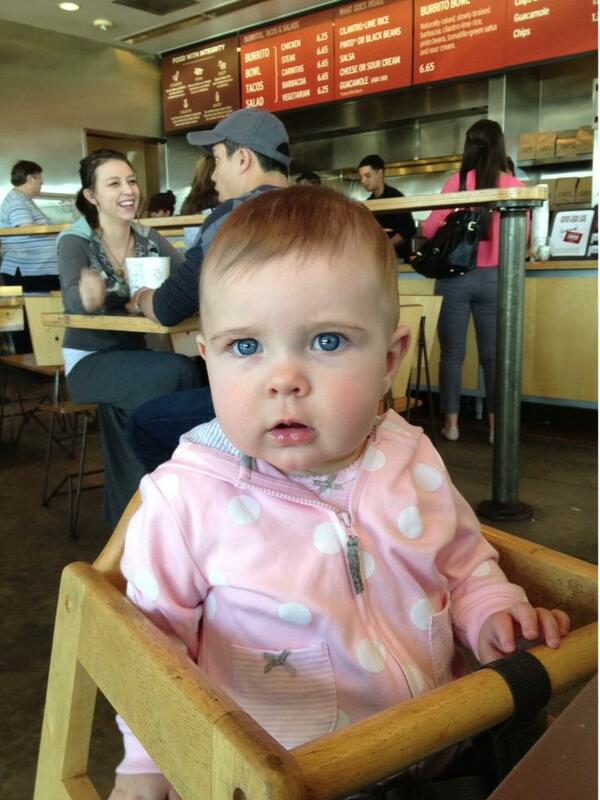 She sat in the highchair like a big girl and looked around the whole time. It was great! We also rearranged my stamp room this week to make Laila a spot. Well, now she occupies MOST of my room, but I can still stamp and not worry about her being in everything or possibly getting hurt. Win, win I hope! My two loves (after Jason and Laila) are stamping and coffee. I LOVE coffee. I can't even think about starting the day without a cup. 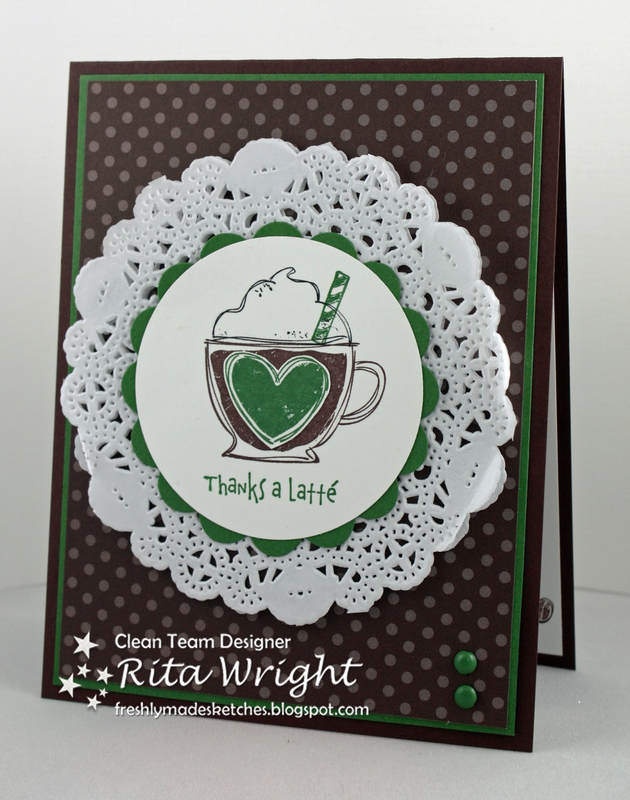 I keep this fun retired set called Like It a Latte for days when I feel like coffee on my stamping. I always like using colors that remind me of Starbucks on these cards as that and Target are two of my favorite places to go. 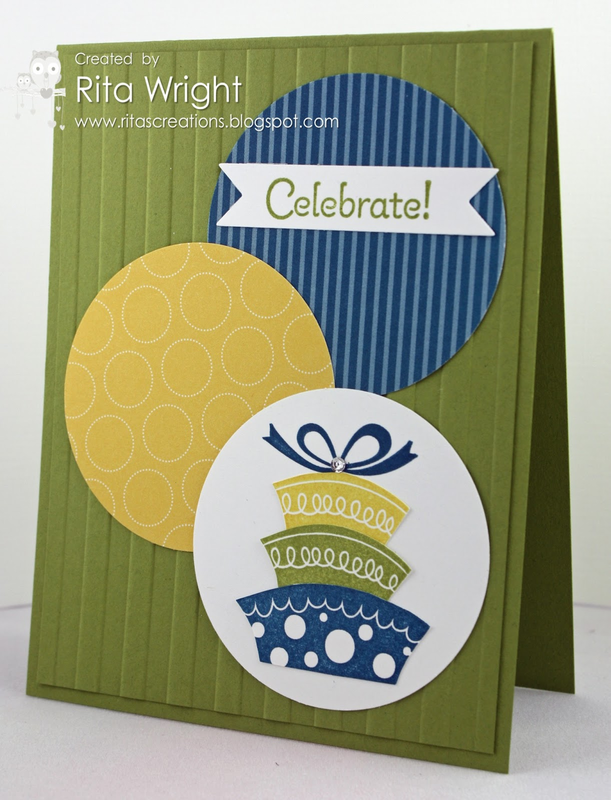 Don't you hate it when you need a birthday card at the last minute and can't find one in your card stash? 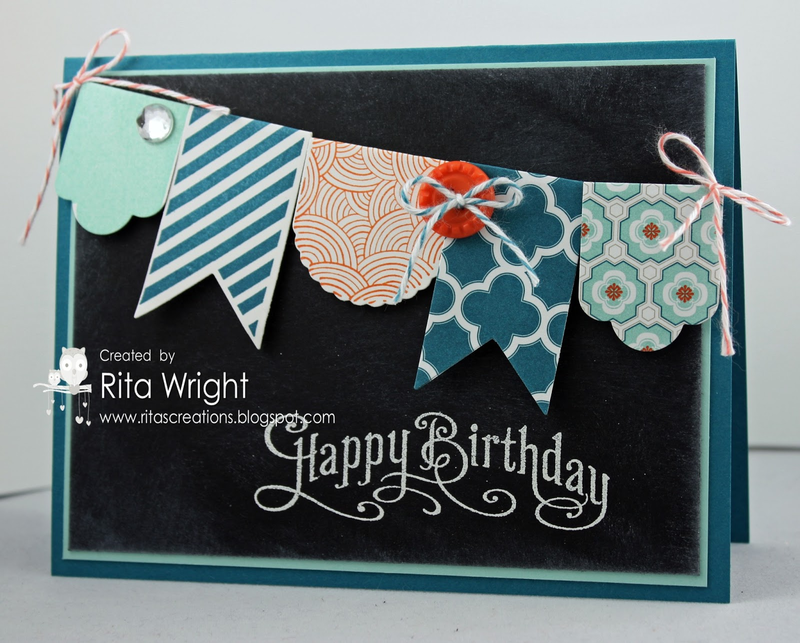 In this class we'll be making a variety of birthday cards so that you'll have some on hand. If you have plenty of birthday cards already, some of the designs can also be made into thank you cards. Just be sure to let me know you'd like some different sentiments and I'll put out some stamp sets for you to choose from. This class is a bit different than my previous ones in that you can make as many or as few of each card as you want. There is a minimum of 10 cards to attend the event, but you are welcome to make more if you'd like. Please email me by noon on Friday which cards you'd like to make and how many of each so that I can get your packet ready for you. Cost is $20 for the first 10 cards, $2 for each additional card. Here's another picture from Valentine's Day. 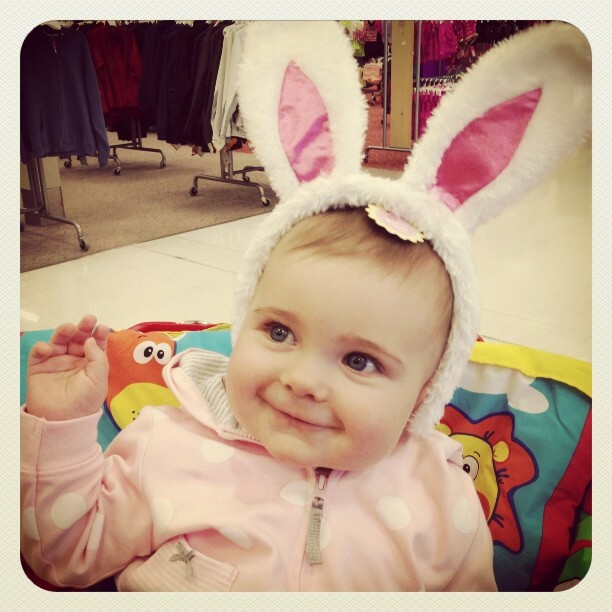 She's just too cute. We've been up since about 5:00 this morning. Yikes. She's in her room playing with daddy and I just love hearing the giggles and happiness coming out of that room. It's amazing how much joy and laughter she's brought back to our home. I thought I'd share the other card I made on Valentine's Day. 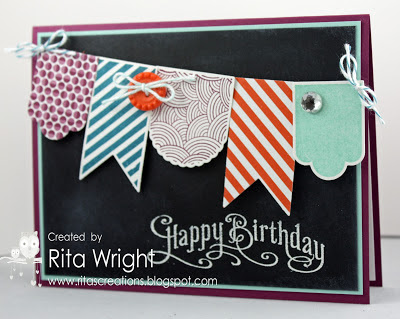 This is another choice for my upcoming birthday card class. I have two more designs to do and I'll be all set to advertise and get ready! I'll share the one I completed today with you tomorrow. For this one, I combined two of my elegant embossing folders, some lovely spring colors, and butterflies! I think it's the perfect spring birthday card! 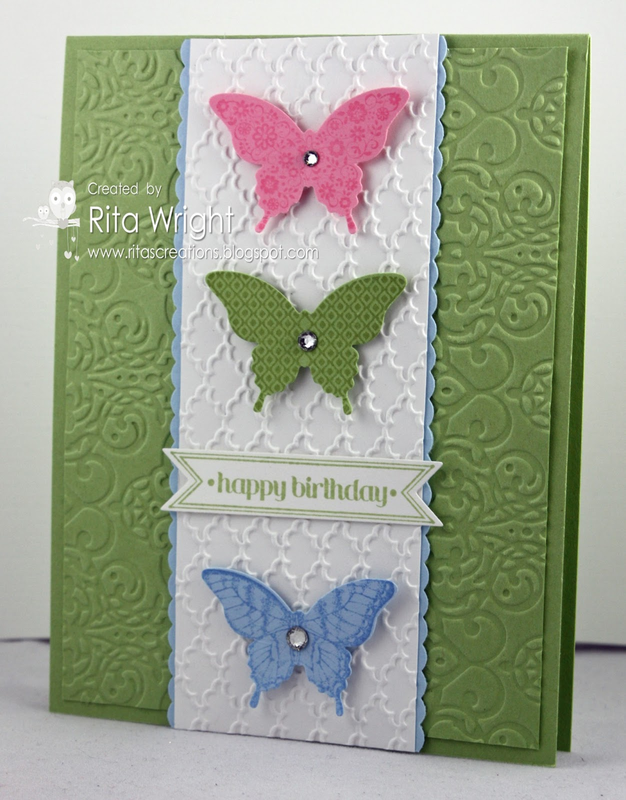 I had to add a little bling to make the butterflies sparkle. 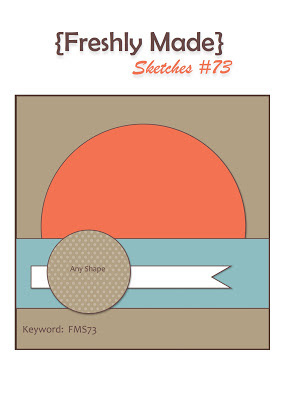 :) The design is based on a sketch from Retro Sketches from last week or the week before. 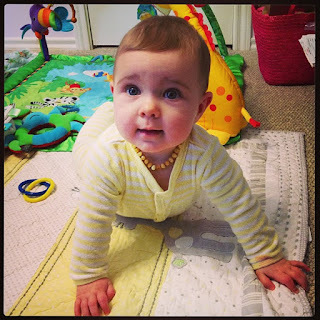 Well, as of yesterday she can get up on her hands and knees and rock. Needless to say, we will be spending tomorrow baby proofing to get ready! Crawling is soon to come. Yikes! I'm going to need to buy lots of coffee to keep up with this girl; she's already wearing me out just rolling! 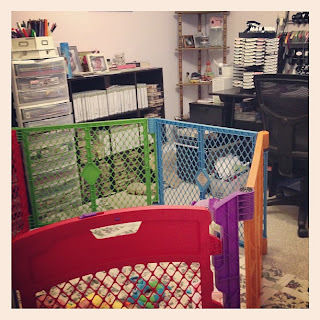 I do have to figure out how to rearrange my stamp room so that we can share it while Jason's working. She definitely needs more space (and a gated off area) to play in while I try to work. Finally, I am SO excited today because she finally signed "milk". We've been working on it since right before Christmas and I hope that means she's starting to catch on. Jason worked all day (and is still there actually), so Laila had to be my valentine today. We went out on the town (to the library) and then shopping (Target). To thank Jason for his hard work and to show our love, we made his favorite dessert, Black Forest Mini Cheesecakes. They are so good and I wish he'd get home so we could have one! He surprised me with a dozen roses. We always say we aren't going to do anything but we both do every time. I'm off to relax and watch a bit of Top Chef that's on the DVR. I hope everyone had a great day today and was able to spend time with someone they love. Happy Valentine's Day! 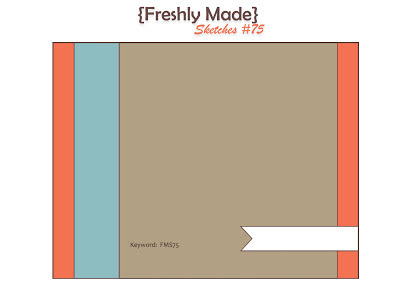 It's time for a new Freshly Made Sketch. 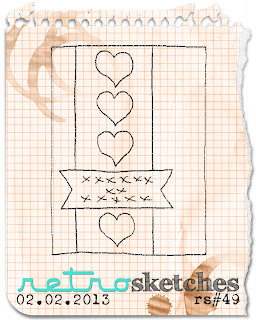 Jen B is our hostess with the mostest this week and she created this fun sketch for us. When I saw it, I immediately thought of the new paper doilies in the Spring Catalog. Then I saw that Jen T. and Linda S. had already used doilies, so I had to regroup and put my thinking cap on. I remembered this card I'd made last year and decided to try something similar to that. 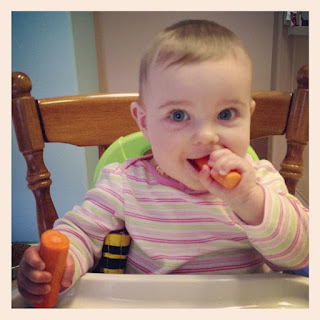 Jason decided to let Laila play with some carrots today. I guess that's what happens when I sleep in. 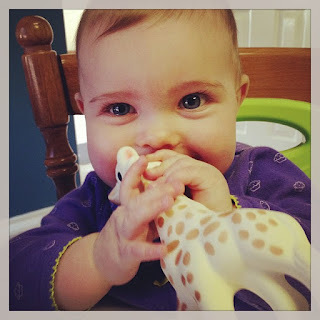 LOL She seemed to like holding them and trying to chew on them, so hopefully she can learn to pick up foods soon. She loves purees for now, so we'll keep feeding those and offering opportunities to learn like this. 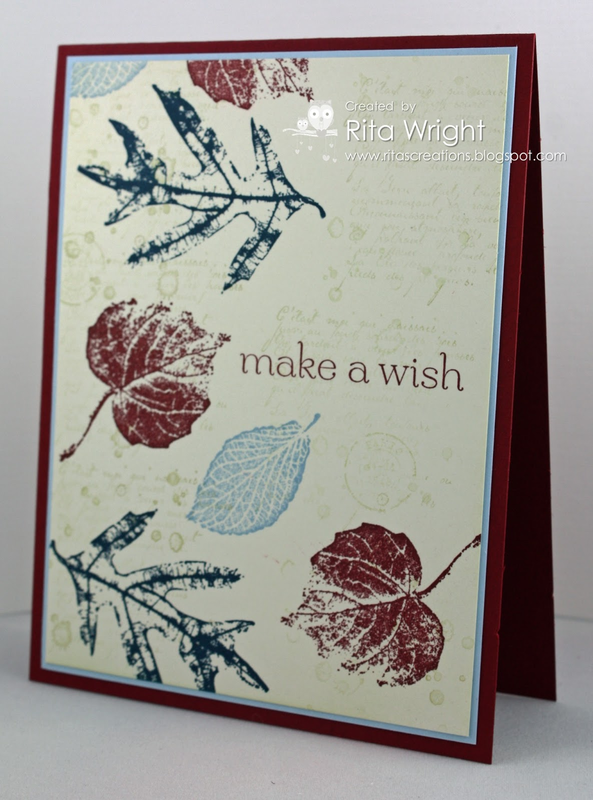 I thought this was a fun sketch at clean&simple stamping this week. I have really been enjoying the more simple challenges as they are way more challenging in a way. For this one, I had the perfect stamp that had yet to see ink. 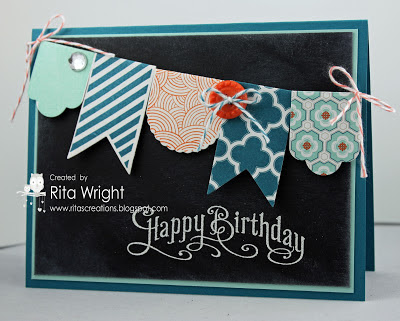 I won a gift certificate to a non-SU company last year in the Dare to Get Dirty challenges on Splitcoast and picked a cake stamp as one of my freebies! Perfect, right?! If you wanted to do this one with only Stampin' Up! 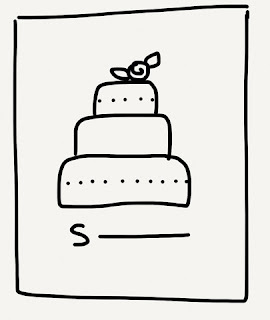 products, the cake stamp from Love & Laughter would work great! I am proud to say that I also addressed and put this one in the mail for my granny! She loves my cards and I've been a bit behind in getting them out to her. I haven't had time to go to the post office to mail a stack of cards to a few blogging friends and some family, but I found a lost stamp to at least send this one to her. She hasn't been feeling that well and I thought she might need a pick-me-up! I know it's been a while since I last posted and that's because Laila started feeling worse. We were up with her most of the night on Thursday and Friday. She developed a cough that's still lingering on. 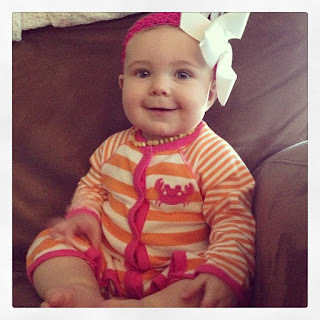 We went to the doctor on Friday and her lungs were clear, but she did have an ear infection in her right ear. She doesn't have a fever and seems fine other than the occasional coughing while she's sleeping. Hopefully that goes away soon. I'm so thankful that we are all getting some rest as those nights last week were rough! I was a total zombie on Saturday. 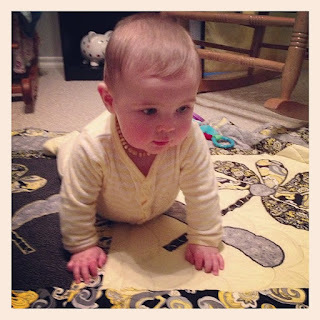 She had fun rolling around on her mat and quilt while I stamped this morning. :) Now it's about lunch time for us! Laila crashed early on me, so I had time to go stamp a bit more before Jason got home from work. 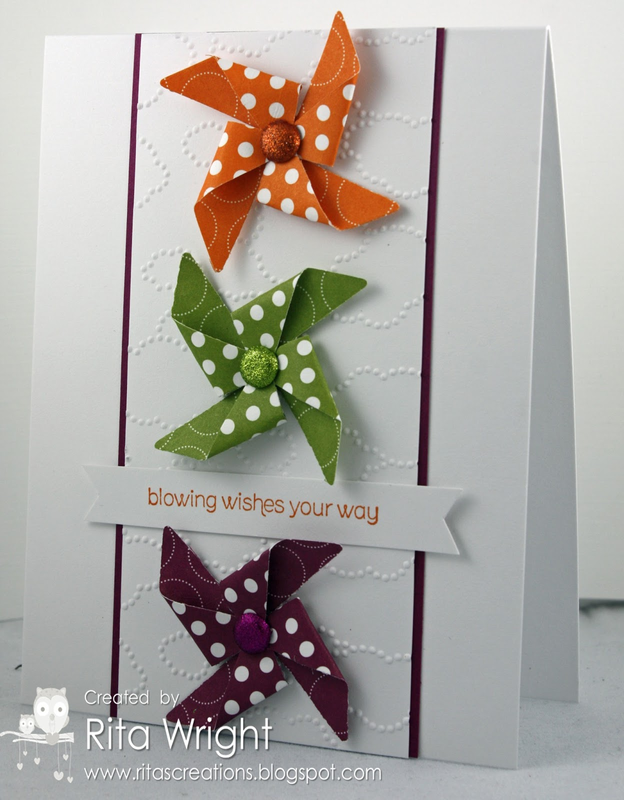 I wanted to finish my pinwheel card for the awesome sketch at Retro Sketches! 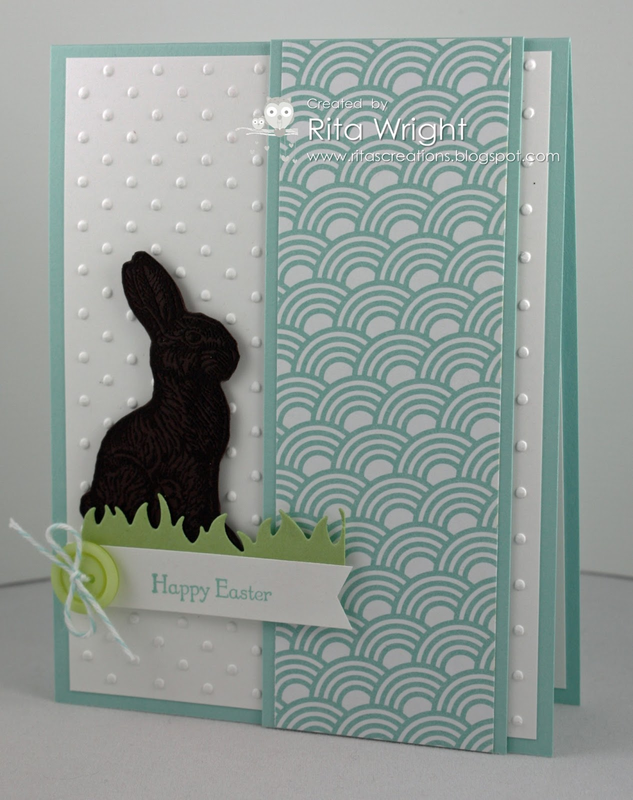 It's another clean-and-simple card with lots of white space! I pulled out my Polka Dot Parade DSP for this one. I love that paper and haven't used it nearly enough! I paired it with some glimmer brads to add a bit of sparkle. 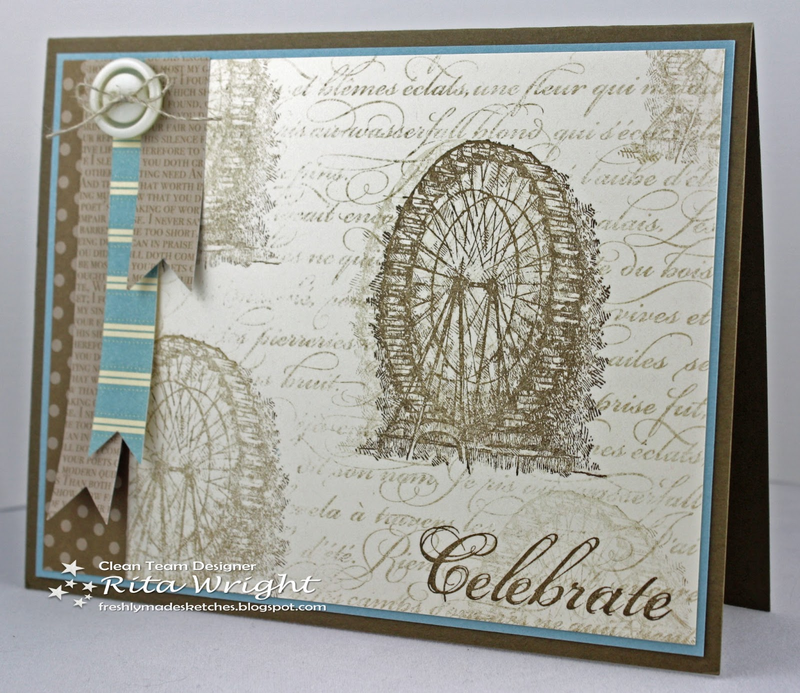 :) The panel behind the pinwheels is embossed with the new Cloudy Day embossing folder. I wasn't sure about that one at first, but now I sorta like it. 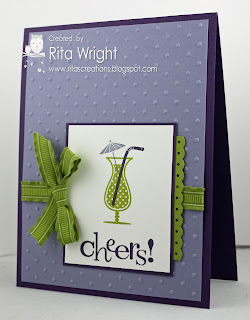 I'm a bit addicted to embossing folders! 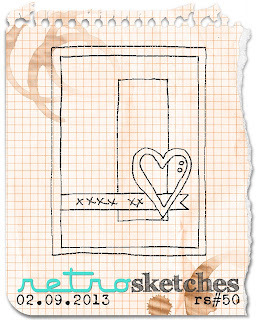 A new sketch popped up at CAS(E) this sketch and I thought I'd stamp today while Laila was playing on her mat. 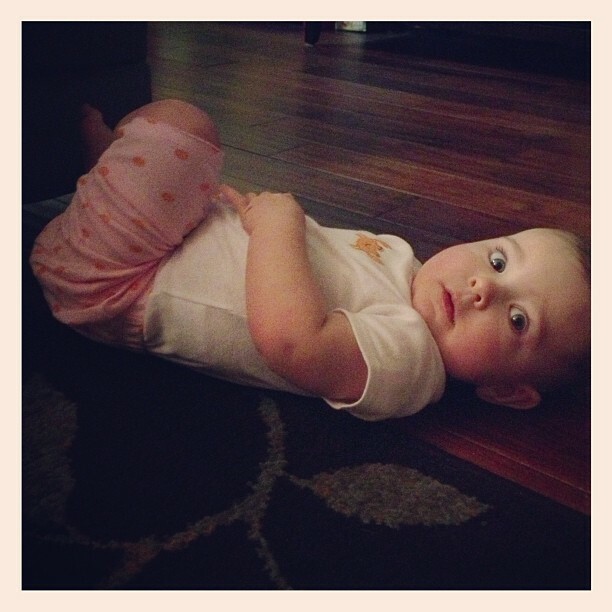 She is rolling like crazy, so I had get up and put her back in place a few times. :) We finally got a card made though! I kept my card pretty simple with LOTS of white space, a bit of piercing, and a pop of color from the designer paper. I'm slowly getting used to leaving open space on my cards, but it will always be a challenge! 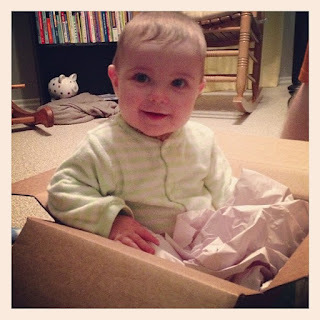 Poor quality picture (sorry), but I thought it was hilarious that she was so happy to be in a box. I guess it's really true that there's no need to spend money on toys! Don't you hate it when you go to cut your card stock and realize that you don't have enough for your project? That's what happened with this card I designed for club. Bummer, right? I managed to change it up a bit and redo it in colors that I did have! Now I know why people hoard paper; I wish I had the budget to do that myself! I think it's still a fun card. Have you tried this chalkboard technique yet? It is so easy and so fun! My white craft ink has been a bit neglected, so this was perfect to give it some use. 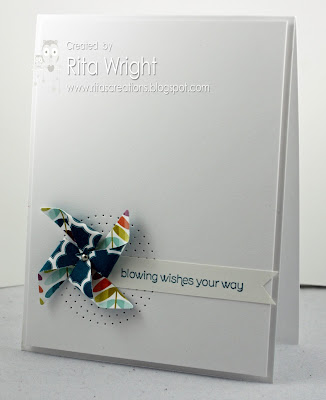 My white embossing powder was happy to come out of the drawer as well! Someone was happy when they woke up this morning! She seems to be eating better today which is great. Her nose is still runny, so we'll see what the nurse says in the morning if it hasn't improved. 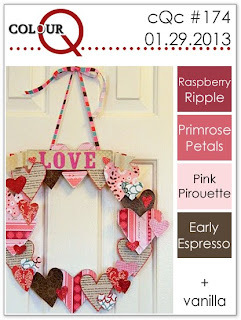 If you are on Pinterest and you are like me, you keep pinning away but rarely do anything with the ideas that you pin. I've decided to quit that and try to be inspired by them. 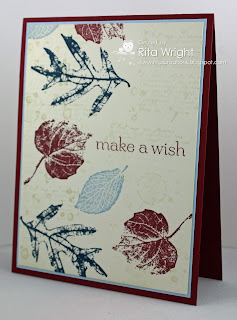 First, I made this card, a Stampin' Up! version of this one. Next, for dinner tonight we made a recipe I'd recently pinned. Now strangely enough, I don't think I'd ever tried chicken teriyaki before. Huh? It's true. I've never been a fan of rice or any type of Asian food until I was pregnant with Laila. PF Chang's orange chicken was my obsession then and I guess the love of it stuck around even after Laila was here. Jason is happy as he loves it has missed it in the years we've been together. I still can't figure out what made me decided I had to have orange chicken one day. I'm sure it was something on Pinterest though! Anyway, the recipe was a bit salty but after talking to Jason, he doubled the sauce ingredients when he shouldn't have. We'll make it again CORRECTLY and it should be better. Now I can add Japanese food to my list of things I'll eat. Laila still has a runny nose and a bit of a cough, but her fever is gone. 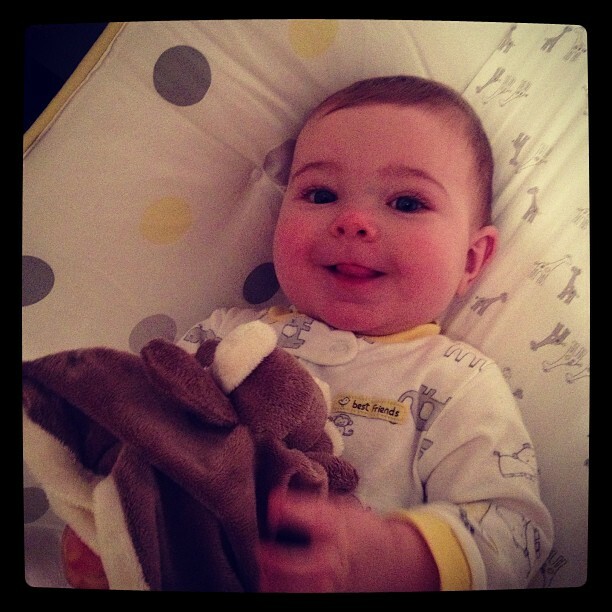 She's been throwing up after her bottles every now and then, but she doesn't seem affected by that too much. We just clean up and start over. The congestion and coughing seem to cause it, so I guess we'll be dealing with it until she's over this. I am hoping we can avoid the doctor, but if things don't clear up soon I'll call and check in with the nurse. I hate taking her in because a few times we've caught something that was worse than what we went in for! 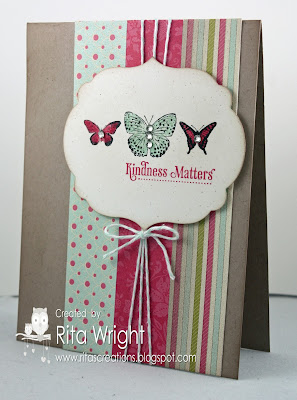 I had a great day stamping with one of my club members (and sweet friend) today! She was kind enough to have me over and it was just us, her two dogs, and her cat. After a rough day on Saturday, being up so much last night, and just general "I need out of the house" crazies, it was such a treat! I was inspired by a sample in the Spring Catalog and wanted to try to recreate it. This chalkboard technique is pretty popular right now and I figured I'd give it a go. I do LOVE how it turned out, so I think we'll be making this one at club. To answer a few questions, this is all SU product. 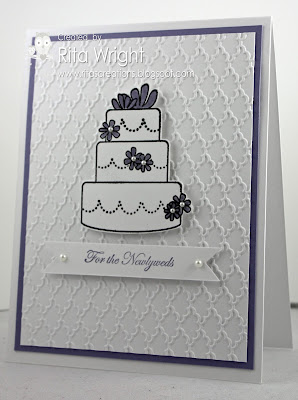 The black is just normal basic black card stock that has been sponged with white craft ink! I stamped the sentiment in the white craft ink, embossed with white embossing powder, and then sponged the white ink to make the erased chalkboard ink. Hope that helps! Laila is so sick. :( She's so congested and can't seem to sleep very well laying down. Jason ended up sleeping in the recliner with her for part of the night and after he came to bed at seven this morning I got up and fed her and then held her for a nap. She was pretty fussy for Jason while I was gone today, but woke up happy after taking a long nap on him. We just put her down for bed and hope the humidifier and elevated mattress will help. My cousin found this cute outfit at Carter's and sent it for Laila. It's so adorable and has a crab on the back. She even sent her that huge matching bow too. lol She's been helping me come up with ideas for Laila's first birthday party which is great because she's great at party planning and I am not! I think we are going to try to do a beach themed party in Melon Mambo, Pumpkin Pie, and Tempting Turquoise. If you see any cool favors or decorations, let me know. :) I love the idea of adding in a few crab things to honor Eli since he never got a birthday party. Just getting in a quick post during the game! We are a bit behind watching it because we had to get Laila to bed. She's so sick today. 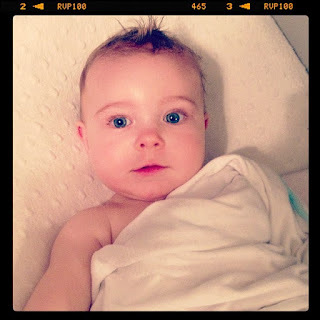 :( I barely survived yesterday with her as she was so fussy and wouldn't nap at all. I love that Jason is home with us four days a week, but the three days he's gone can be rough sometimes. I have so much respect for single moms now. Anyway, this morning we got up and she is congested and her poor little nose has been running all day. I feel so bad for her. I'm pretty sure she's teething too! Ugh. 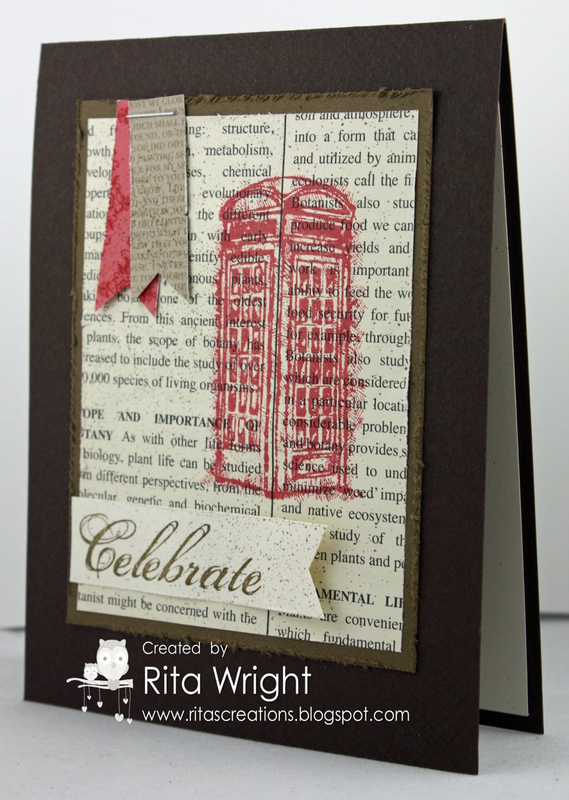 I did take a bit to work on some ideas for my stamp club that's on Friday and this card was one of my attempts. I don't really like how it turned out, so I don't think we'll be making this one. Back to the drawing board! I always struggle to figure out what we are going to make! 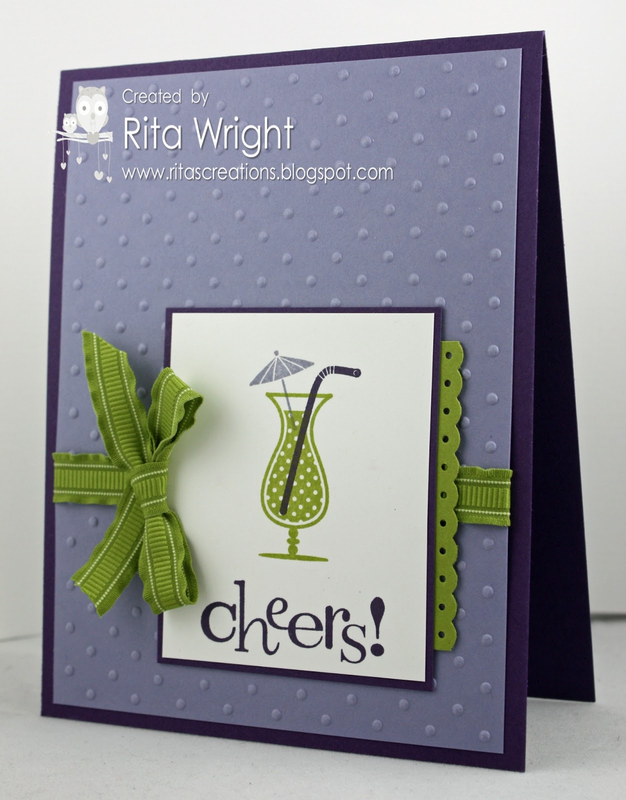 If you'd like to try the technique on the embossed layer, you can find it here. I like how it turned out, but I just couldn't figure out what to do with it. No crawling yet, but she can roll and spin around to get exactly where she wants to go! I love the colourQ colors this week and wanted to find time to play. 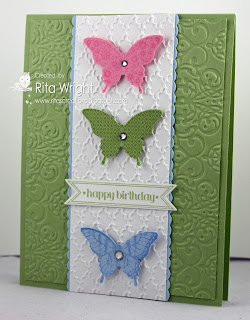 Luckily Laila let me stamp some yesterday so I was able to make a quick card for it. I started off with the idea of lots of white (well, vanilla) space, but I'm not sure what happened? It's still a pretty simple card, just a bit more layers and darker than I had planned. I think my love affair with Early Espresso just took over and the vanilla got tossed aside. The heart wants what it wants, right? 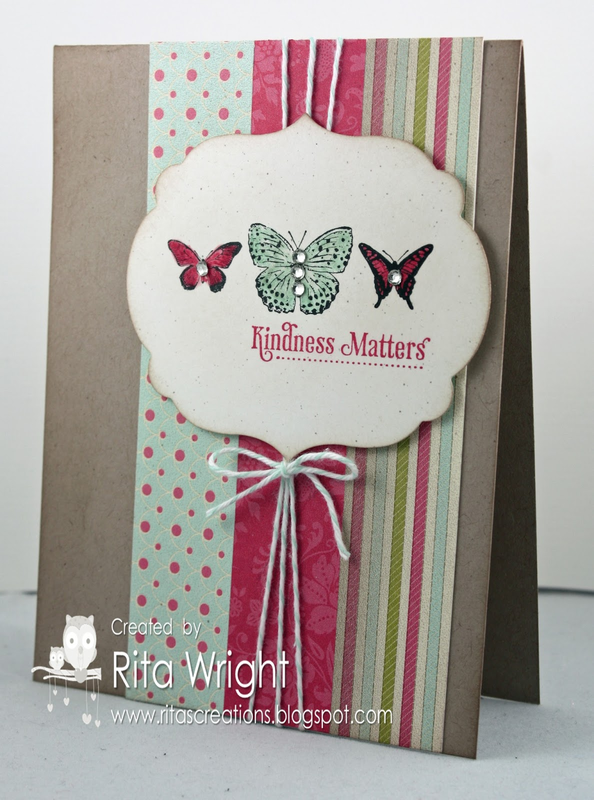 lol I've been struggling to use my new Hearts a Flutter bundle, but I think it worked okay on this one. 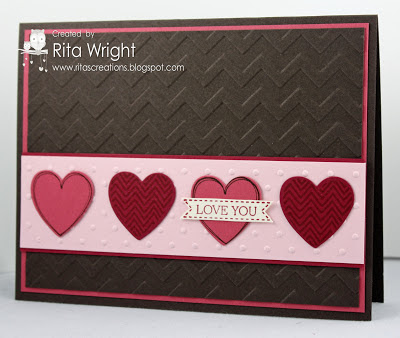 I LOVE the chevron heart stamp. Obsessed? Yeah, a bit. 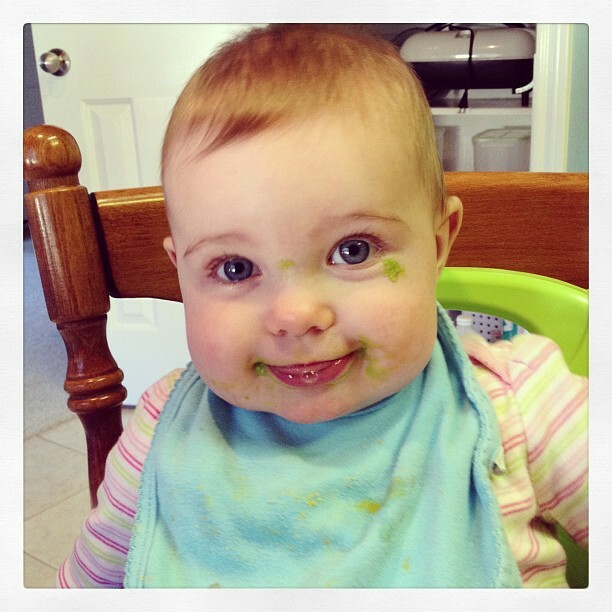 Laila decided that peas would make a great facial yesterday. She is so silly! We had another rough evening, but Tylenol seemed to help last night as she slept from 7 until 5:30 this morning. This teething thing is rough on everybody. It breaks my heart for her to be upset and hurting.